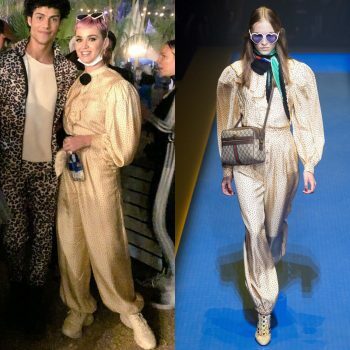 She is wearing Gucci Spring 2018 jumpsuit. 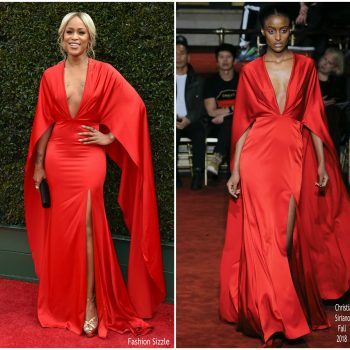 Eve was in attendance at the Daytime Creative Arts Emmy Awards on Friday (April 27) in LA. 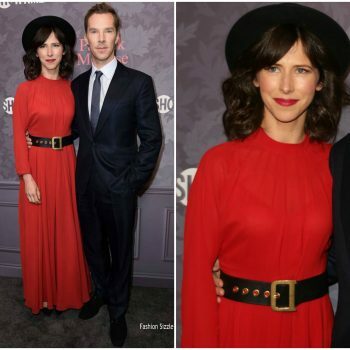 She is wearing a red Christian Siriano Fall 2018 dress. Jordana Brewster attended 2018 We All Play Fundraiser hosted by the Zimmer Children’s Museum on Saturday afternoon (April 28) in Santa Monica, Calif. She wore a Misa Resort 2017 dress. Tracee Ellis Ross was in attendance at the FYC event for ABC’s ‘Blackish’ on Saturday (April 28) in Burbank, California. 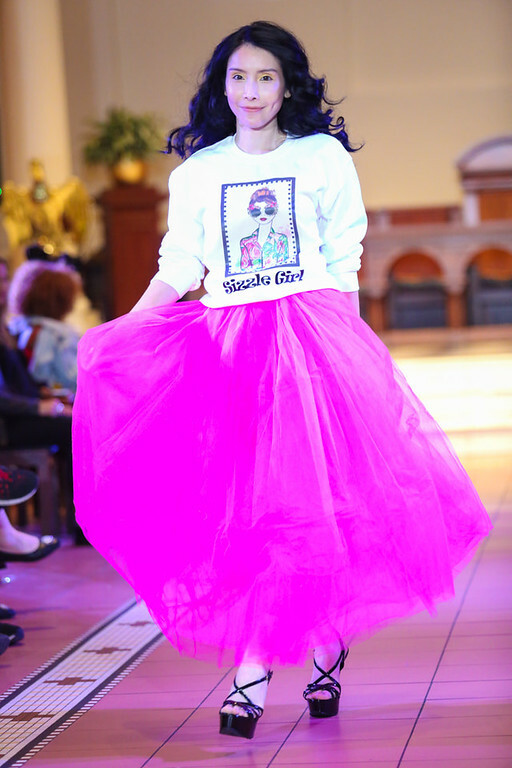 She wore a Esteban Cortázar dress. 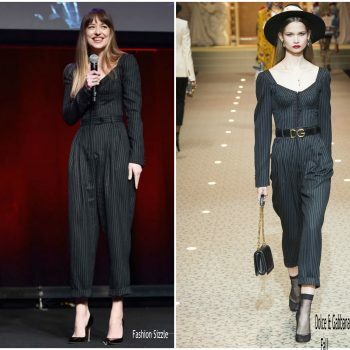 Felicity Jones attended the 2018 CinemaCon: Focus Features Presentation at Caesars Palace held at the National Association of Theatre Owners on Wednesday (April 25) in Las Vegas. She is wearing a Valentino design. 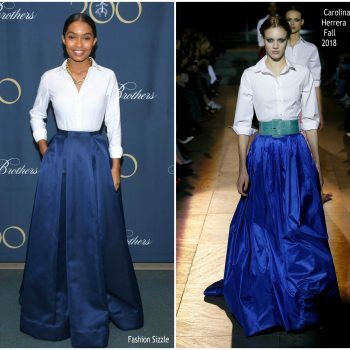 Yara Shahidi attended the Marie Claire Fresh Faces issue celebration on Friday (April 27) in Los Angeles. 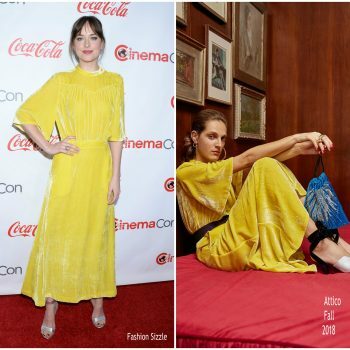 She is wearing a wearing Giambattista Valli Couture Fall 2017 Dress styled with Jimmy Choo Minny Sandals ($895.00). Caitlin Fitzgerald was in attendance at the Tribeca Film Festival premiere of ‘Sweetbitter’ on Thursday (April 26) in New York City. 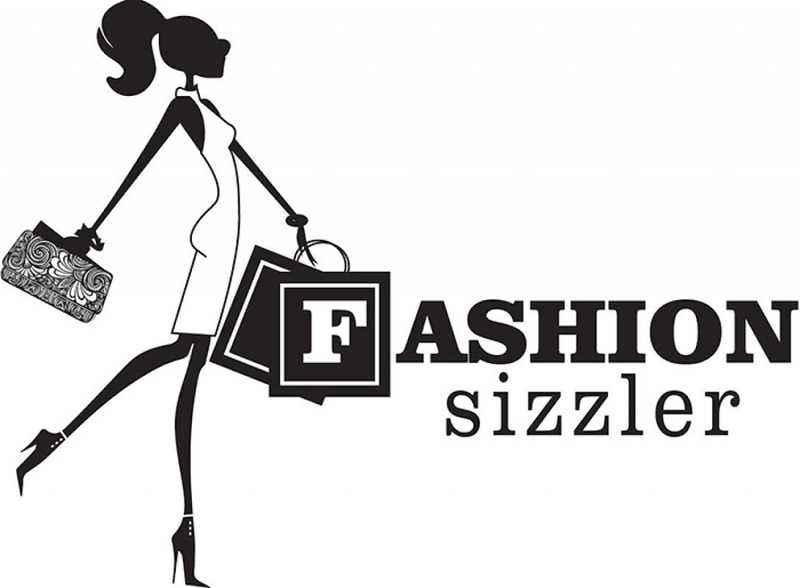 She is wearing a white black polka dot off-the-shoulder dress. 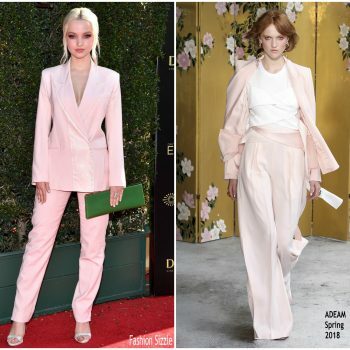 Ella Purnell attended the Tribeca Film Festival premiere of ‘Sweetbitter’ on Thursday (April 26) in New York City. 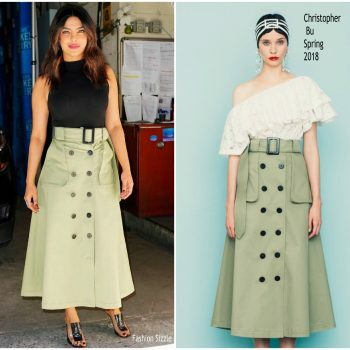 She wore a Chanel Pre-Fall 2018 design. Jennifer Garner attended CinemaCon. 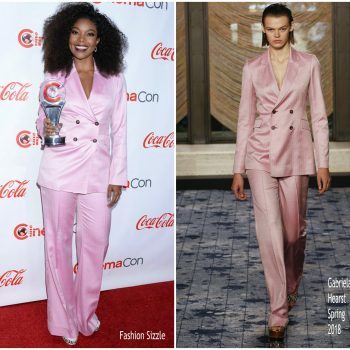 She walked the red carpet at the ‘Peppermint’ presentation on Tuesday (April 24) in Las Vegas, Nevada. 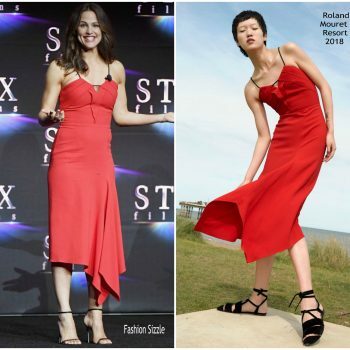 She wore a red Roland Mouret Resort 2018 dress. Kylie Minogue stopped by the SiriusXM Studios to discuss her new album, ‘Golden,’ on Thursday (April 26) in New York City. 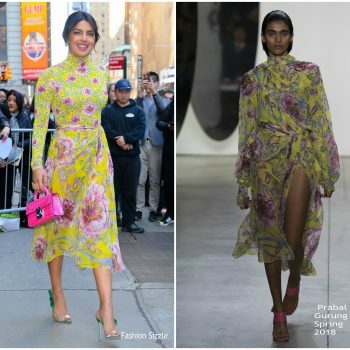 She wore Emilio Pucci Spring 2018 dress. Elizabeth Debicki was in attendance at the Sydney premiere of ‘Breath’ yesterday (April 27). 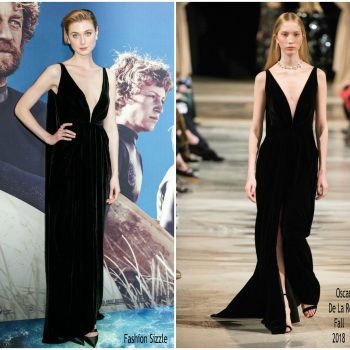 She wore a velvet Oscar de la Renta Fall 2018 gown. Folowing her appearance on the redcarpet , Jennifer Lopez performed her new song ‘El Anillo’. She wore an embellished metallic bodysuit by Giannina Azar styled with very long hair extensions . Jennifer Lopez attended and performed at the 2018 Billboard Latin Music Awards on Thursday (April 26) in Las Vegas, Nevada. 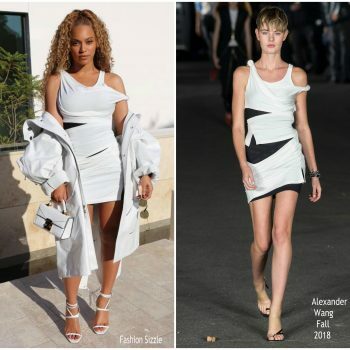 She is wearing a silver David Koma Fall 2018 mini dress. 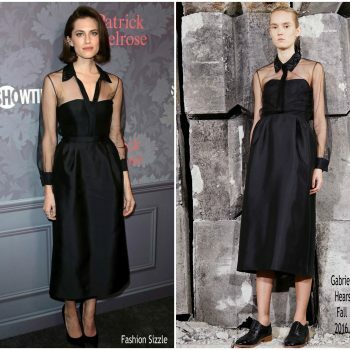 Allison Williams attended the ‘Patrick Melrose’ LA premiere on Wednesday night (April 25) at the Linwood Dunn Theater in Los Angeles. 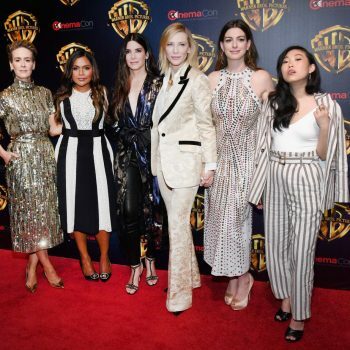 She wore a black Gabriela Hearst Fall 2016 dress styled with black pumps. .
Cate Blanchett was in attendance at CinemaCon 2018, this time promoting ‘The House With A Clock In Its Walls’ on Wednesday (April 25) in Las Vegas, Nevada. 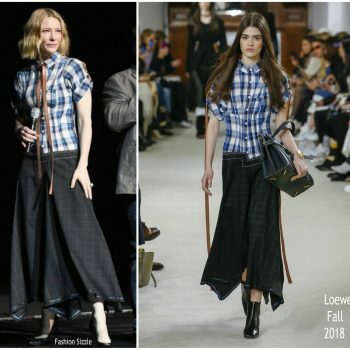 She is wearing a Loewe Fall 2018 design. Katie Holmes attended the Brooks Brothers Bicentennial Celebration on Wednesday (April 25) in New York City. She wore a plum Zac Posen gown. Amber Heard attended the CinemaCon Presentation of ‘Aquaman’ on Tuesday (April 24) in Las Vegas, Nevada. 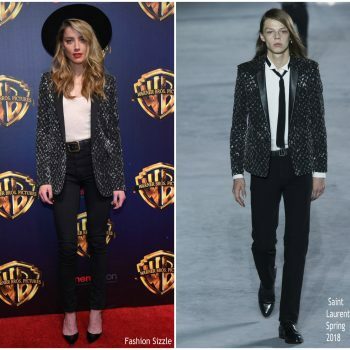 She wore a Saint Laurent Spring 2018 design. 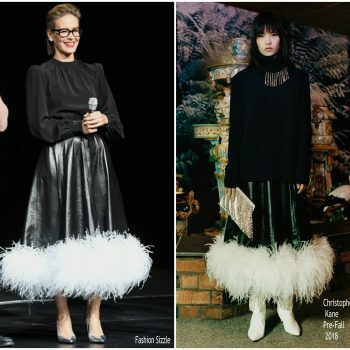 Leslie Bibb (in Adeam), Annabelle Wallis (in Prabal Gurung) and Isla Fisher (in Ulla Johnson) at ‘The Big Picture’ CinemaCon presentation of ‘Tag’ on Tuesday (April 24) in Las Vegas, Nevada. 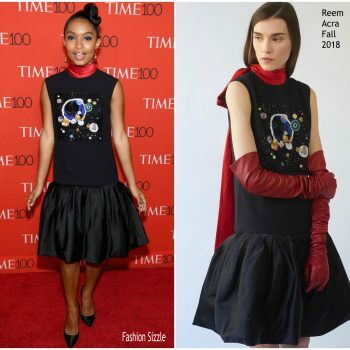 Yara Shahidi attended the t the 2018 Time 100 Gala on Tuesday night (April 24) at Jazz at Lincoln Center in New York City. 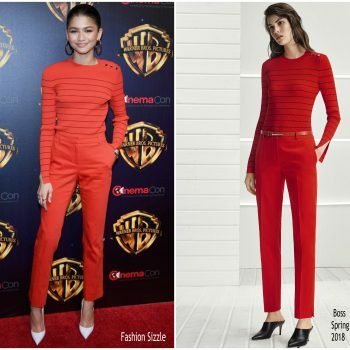 She wore a Reem Acra Fall 2018 styled with Brian Atwood heels. Rachel Weisz was in attendance along with Rachel McAdams at the ‘Disobedience’ premiere during the 2018 Tribeca Film Festival on Tuesday (April 24) in New York City. 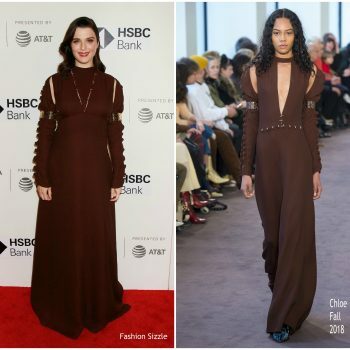 Showing her baby bump Rachel rocked a brown Chloe Fall 2018 dress. 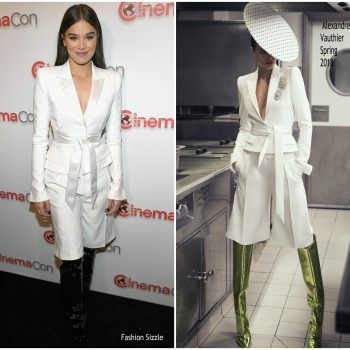 Zendaya Coleman attended ‘The Big Picture’ CinemaCon presentation on Tuesday (April 24) in Las Vegas, Nevada. 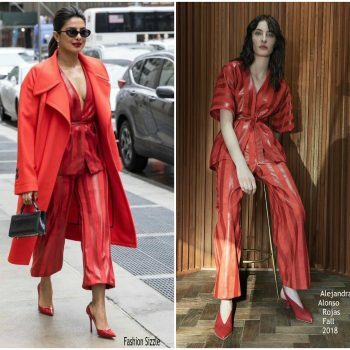 She wore a red BOSS Spring 2018 design. Millie Bobby Brown was in attendance at the Time 100 Gala in New York City on Tuesday (April 24). She is wearing a floral Dolce & Gabbana tulle ball gown. 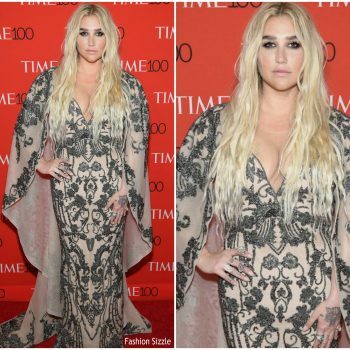 Kesha was in attendance at Time Magazines 100 Most Influential People of 2018 Gala on Tuesday (April 24) in New York City. She is wearing a y MIKAEL D gown . 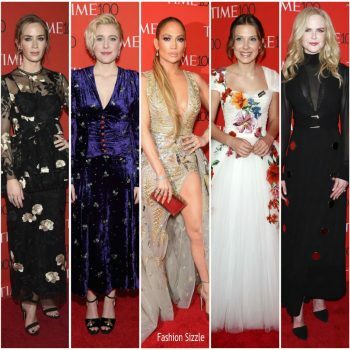 Greta Gerwig was in attendance at the 2018 Time 100 Gala on Tuesday (April 24) in New York City. 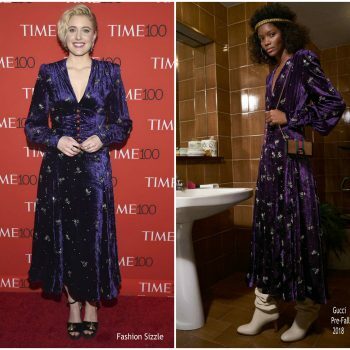 She wore a purple Gucci Pre-Fall 2018 dress. Halle Berry attended 2018 Matrix Awards in New York. 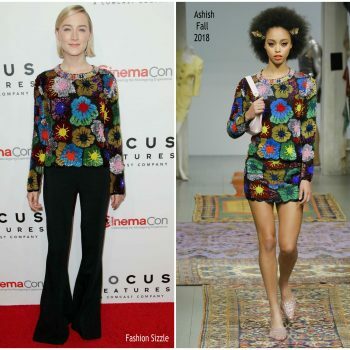 She is wearing a grey Eleanor Balfour’s fall ’ 2018 styled with a pair of Roger Vivier Flower Strass Buckle pumps. Lily Aldridge was spotted Leaving The Greenwich Hotel April 24 2018 She is wearing a Chloe tank top , jacket, and pants She styled her look with a Chloe purse glasses and Mercedes Castillo heels. Jessica Simpson was spotted out on Tuesday (April 24) in New York City en route to a meeting. 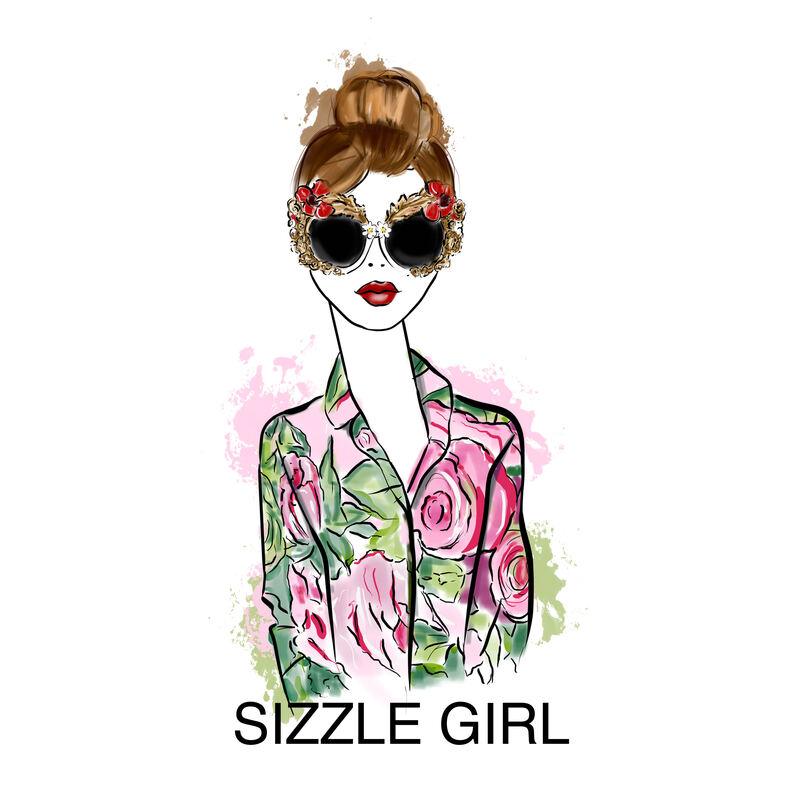 She wore a Gucci dress and jacket styled with a Chloe purse and Gucci sunglasses. 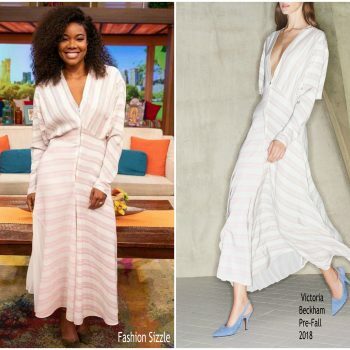 Gabrielle Union made a guest appearance at ‘Despierta America’ to promote ‘Breaking In’ on Tuesday (April 24) in Miami, Florida. 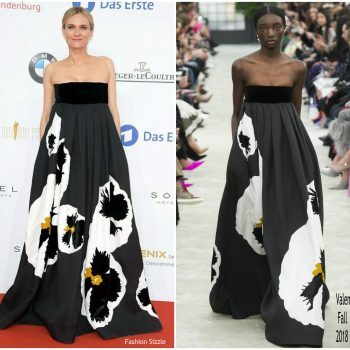 She is wearing a white Victoria Beckham Pre-Fall 2018 dress . 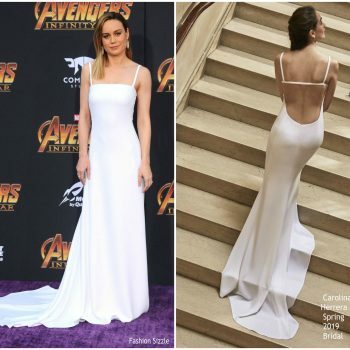 Chloe Bennet was also in attendance at the ‘Avengers: Infinity War’ LA Premiere yesterday on Monday (April 23 She is wearing a strapless belted Monique Lhuillier gown. 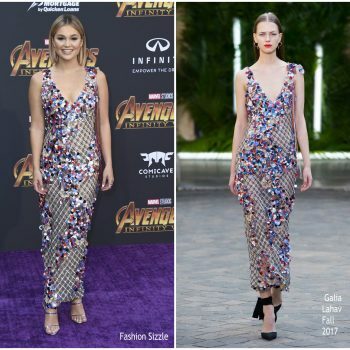 Olivia Holt was in attendance at the LA premiere of Marvel’s ‘Avengers: Infinity War’ LA on Monday (April 23). She wore a Galia Lahav Fall 2017 dress styled with a pair of Giuseppe Zanotti Harmony heels. 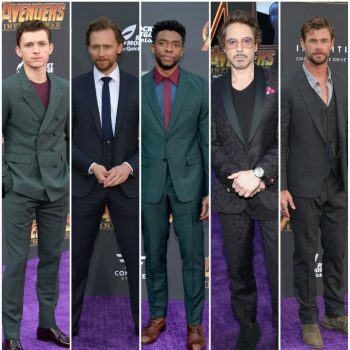 Angela Bassett attended the LA premiere of Marvel’s ‘Avengers: Infinity War’ LA on Monday (April 23). 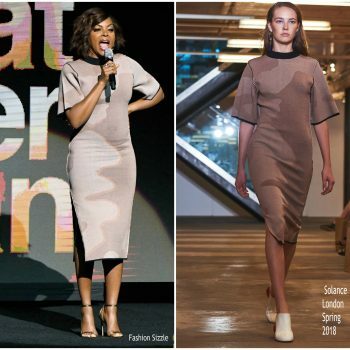 She wore a Mario Dice Fall 2018 design. 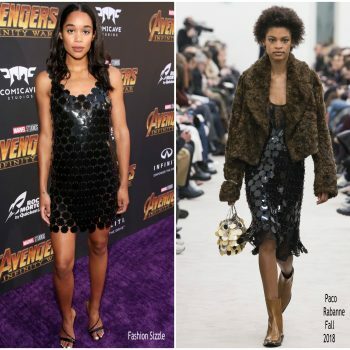 Laura Harrier was in attendance at the LA premiere of ‘Avengers: Infinity War’ LA on Monday (April 23). 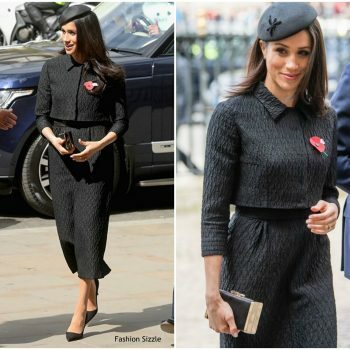 She wore a black Paco Rabanne’s Fall 2018 dress.